A vegetarian friend was to come to dinner, which coincided with Paulo lending me his copy of the first Ottolenghi cookbook. Well you can see where this is going. I’ve previously had mixed results cooking Ottolenghi recipes. I enjoyed his chermoula aubergine with bulghar and yoghurt, which I think I improved by giving the aubergine a little bit of a smoke in the Bradley. I also liked his recipe for the chicken sofrito, a classic Sephardic dish. However I do find his recipes a little fiddly, and rather demanding of the designated washer-upper (Hannah) usually requiring plenty of bowls, dishes and pans. There are plenty of separate steps for each recipe and it can be quite hectic trying to cook a bunch of them simultaneously for the first time. I’d contrast this with Moro which achieves at least as delicious results, but which doesn’t manage to make you quite as sweaty and stressy in the process. So I picked out a few interesting looking recipes, hoping to expand my repertoire of vegetable dishes. My starting point was a loaf of lovely sourdough, and basing a meal around some good bread really feels right, the sort of thing the Spanish (or French, or Italians) might do without thinking, helped no doubt by the panaderia open all hours just around the corner (we have a Spar, it’s not the same). So I chose butter bean puree with dukka as a starter. The butter bean puree was lovely and smooth, mainly because I passed it through a sieve to get rid of any tough bits of skin remaining. It tasted good, but with four cloves of quite pungent garlic it was too garlicky, and so this dish won’t help your love life. In fact I was forced to sleep on my left side that night to avoid choking my partner. I’d advise more like a single clove if you make this. The “dukka” is a nice idea, adding spice and crunch to the smooth paste, but it’s a bit of a hassle to go to for a single dish. Ottolenghi suggests you keep some in tupperware, but I know how that plan would end (Hannah chucking it out in about a year). For main I tried the beetroot and saffron rice cake. This came out very pretty looking but a little dry, and there really wasn’t much flavour. It probably needs more salt and lemon zest, but frankly I wouldn’t bother making this again. I also tried the Jerusalem artichokes with manouri and basil oil, substituting manouri with halloumi as there are no Greek supermarkets in Birmingham which might stock this soft cheese. This dish didn’t really work, the drizzling of basil oil wasn’t sufficient to bring the dry and fried ingredients together into a proper salad. Now I read it back, I don’t really understand this recipe or my decision to cook it. So, really only one qualified success out of three. 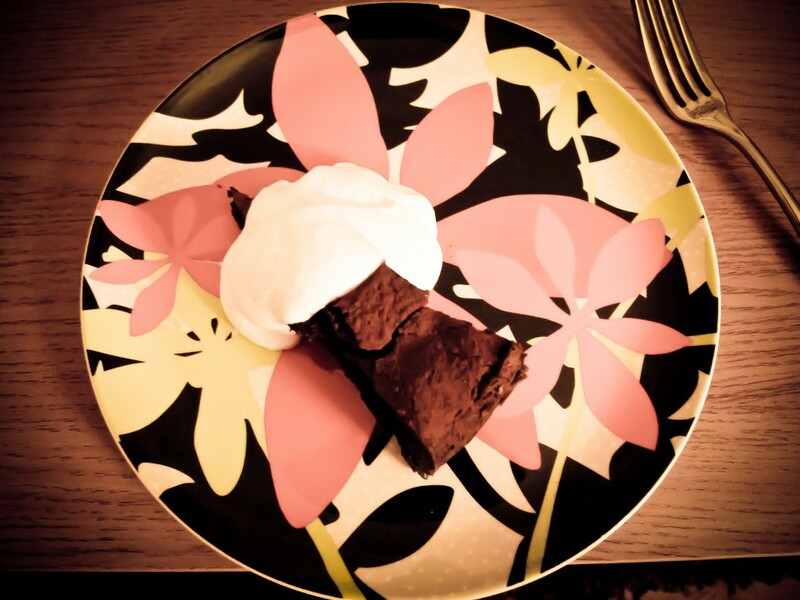 Luckily Ottolenghi didn’t completely let me down as I cooked his chocolate fudge cake. I can’t be bothered to transcribe the recipe, but luckily it has been replicated on the Lemonpi blog. I can’t recommend this cake enough. It’s absolutely unapologetically rich, and it’s genius is that you have two layers, a more solid (flourless) cake-like base, topped with an undercooked layer which comes out like mousse. Your fork slides through the top layer and the bottom layer offers resistance. Served with some whipped cream it is absolutely superb. I’d like to vary this with some flavourings, Hannah thinks orange would work well. You could even do a Christmassy version with cassis and cranberries.